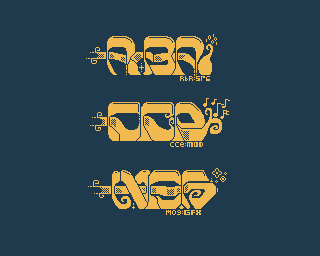 Inspired by SV'2010 XE Invitation - Logos by Piesiu, I wanted to something similar. However, after showing it around, Den mentioned that it's barely readable - so I added subtitles. Made the gaps to be one pixel wide, and it just felt natural to add zeros and ones to RbRs nick, notes to cces and flowerlike things to mine - just to further visualice what was done by whom. In the end, we had a problem with clearing the screen - so the 3ln logo somehow stayed in the background, and the nicks placed themselves ontop - which gave a neat effect - so we left that in. Watch the linked intro to see that one at the end of it.